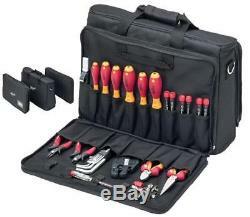 Wiha - 37137 - Technicians Vde Electrical Tool Kit 29pc. A quality service technicians tool kit, suitable for most electrical and electronic maintenance work on machines and components. The kit not only contains most of the tools a service technician will need to carry out a variety of electronic applications, but it also has a space designed to house a laptop and documents. The bag can be used separately thanks to zip fastening. Ideal tool kit for use on all work on or around electrical components up to 1000V AC. VDE tools with insulation up to 1,000 V AC, GS tested. Individually tested for electrical safety according to EN/IEC 60900:2004. Insulated VDE tested tools: VDE screwdrivers SlimFix: slotted 3.5, 4mm, Phillips: PH1, PH2, Pozidrive: PZ1, PZ2, Voltage tester: 100-250V, Needle nose pliers, Diagonal cutters, PicoFinish Screwdriver: Slotted: 1.5, 2, 2.5, 3mm, Phillips: PH00, PH0, Diagonal cutters Electronic, Pointed pliers, Cable stripper, O 4,0-28mm, Automatic stripping pliers, 0.02 to 10.00 mm2, Switch cabinet key, Hex keys 1.5 to 10mm. Images shown are for demonstration purposes. Product will match description but may vary from images shown. All our listings include VAT at the current rate. We dispatch orders Monday to Friday. We aim to dispatch all other orders that have been paid & confirmed before 16:00 on the same day. If you are not happy with the charge the sale can be cancelled. For full details please check our Terms and Conditions. We pride ourselves on making sure each and every customer is satisfied before, during and after a sale is completed. Please put your own return address on the back of the package in case there is any problem delivering to us. The item "Wiha 37137 Technicians Vde Electrical Tool Kit 29pc" is in sale since Tuesday, June 19, 2018. This item is in the category "Business, Office & Industrial\Hand Tools\Tool Kits & Sets". The seller is "pcarena-bristol" and is located in Farnborough.